We have started off 2014 with Phase II of our Clothes That Work renovation project. 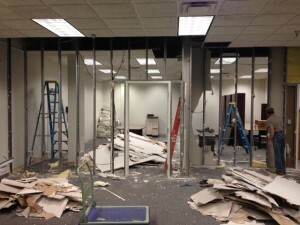 Through March, our client services, donation room and lobby will be under construction. Because of this, we need to make some slight adjustments to our donation area. If you are donating to Clothes That Work during this time and have more than 3 bags or 25+ items on hangers, please call us ahead of your drop off at 937.222.3778 so we can plan ahead and better serve you! A reminder that donation hours are Monday – Thursday 9 am – 1 pm and the Second Saturday of each month 9 am – noon. We are also looking for volunteers for the month of January for a customer service role to greet donors and accept donations from 10 am – 1 pm Monday – Thursday. If you are interested, please contact Melanie Tullis at 937.222.3778 x170 or melanie.tullis@clothesthatwork.org. Thank you for your patience while we renovate!